While not a widely analyzed or recognized economic indicator, the annual Calgary Stampede tarp auction for the chuckwagon races is a solid indicator of business confidence in Calgary. Chuckwagon racing is one of the most exciting events held annually at the Calgary Stampede, with teams vying for more than $1 million dollars in prize money. Every year, businesses bid on the opportunity to be a sponsor for, and have their logo displayed on, one of the chuckwagons participating in the GMC Rangeland Derby. Because Calgary’s economy is so strongly tied to the world price of oil, WTI crude oil is one of the most tracked commodities locally. When WTI prices are high, the economy booms. When WTI prices are low, things slow down substantially. As a result, the total amount spent each year on chuckwagon sponsorship packages actually ends up tracking well for economic confidence in the Calgary market. The monthly average WTI spot price was $30.32 per barrel in February 2016 and $37.55 per barrel in March 2016, while the spot price for February 2017 was $53.47 and $47.70 at close on March 23, 2017, the day of the auction. 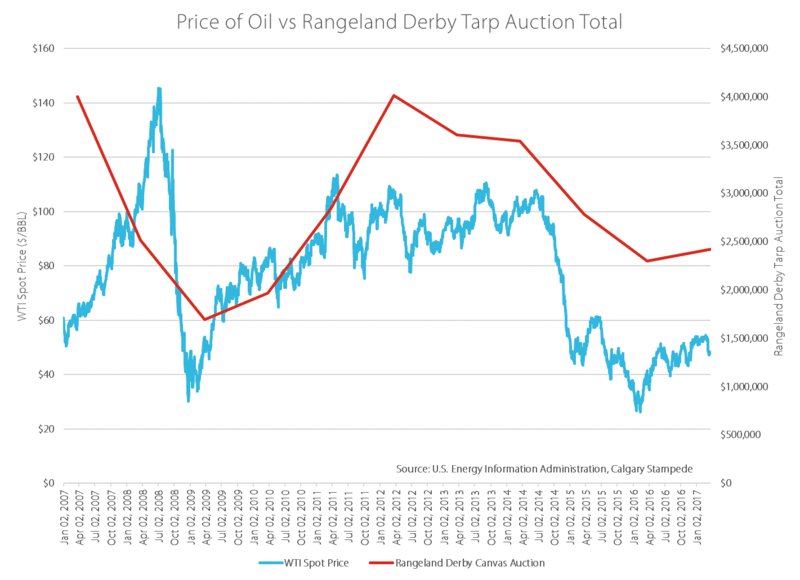 The total spent on the chuckwagon tarp auction for 2017 was approximately $2.4 million, a better result than the $2.3 million total for 2016 and the low of $1.7 million recorded in 2009. While recovery remains a long way away, it would appear that thanks, in part, to the recent increase in oil prices, confidence is increasing in Calgary’s business community. It is hoped that this confidence can be maintained and strengthened in the months to come.